No. Multimode equipment will not launch (inject) enough light into a single-mode fiber since the light carrying core of this fiber is only 9 microns in diameter compared to 62.5 microns in diameter for multimode fiber. Unfortunately you must use single-mode equipment. If the fiber distance is short however, the cost for replacing the single-mode fiber with multimode fiber may be more economical than the higher cost for the single-mode electronics. 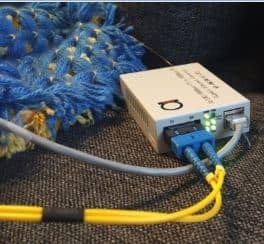 If you had not yet decided what kind of cable to use, here are some tips of choosing correct fiber optical cable, especially it is important in case of FTTx. AD-Technology product groups include all type of single mode and multimode products, as well as SM-MM converters are available – be it integrated 1×9 Fiber Module type, or Universal SFP to SFP type, so even you have installed a single mode cable, and need connect a multimode laser device, you can use a converter. Also, you can be interested to read article Can I use Single Mode patchcord instead of Multimode?